HMG-CoA reductase is the rate-limiting enzyme for cholesterol synthesis and is regulated via a negative feedback mechanism mediated by sterols and non-sterol metabolites derived from mevalonate, the product of the reaction catalyzed by reductase. Normally in mammalian cells this enzyme is suppressed by cholesterol derived from the internalization and degradation of low density lipoprotein (LDL) via the LDL receptor. Competitive inhibitors of the reductase induce the expression of LDL receptors in the liver, which in turn increases the catabolism of plasma LDL and lowers the plasma concentration of cholesterol, an important determinant of atherosclerosis. Alternatively spliced transcript variants encoding different isoforms have been found for this gene. 1. Gene expression profile and the biological functions of HMGCR in gastric cancer were studied. 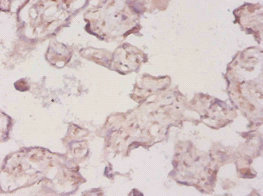 It was found that the expression of HMGCR was increased in gastric cancer tissues. Over-expression of HMGCR promoted the growth and migration of gastric cancer cells, while knocking down the expression of HMGCR inhibited the growth, migration and tumorigenesis of gastric cancer cells.